UPDATE (12/4/13): There are new regulations in place that stipulate that if you have a foreign driver’s license and wish to get a full Argentina driver’s license, you need to get a certificado de legalizacion before going to get your Buenos Aires driver’s license. Without this, you will only be given a “beginner’s license” which means that you cannot drive on streets that are more than 70 kmph for the first six months. Beginners also need to take a six hour course on “seguridad vial” and present that certificate as well to get a full license. Unfortunately, the certificado de legalizacion cannot be obtained from the US Embassy. You must get it from the Department of Vehicles for your state and then have an apostille from the Secretary of State as well – an arduous process that not many people will undertake. The rest of the information below should be the same. I previously wrote about driving in Buenos Aires, now I’ll write about getting your driver’s license in Buenos Aires. Now, you may be saying, “Wait, shouldn’t the order of these two posts be reversed?” Technically, you would be correct. 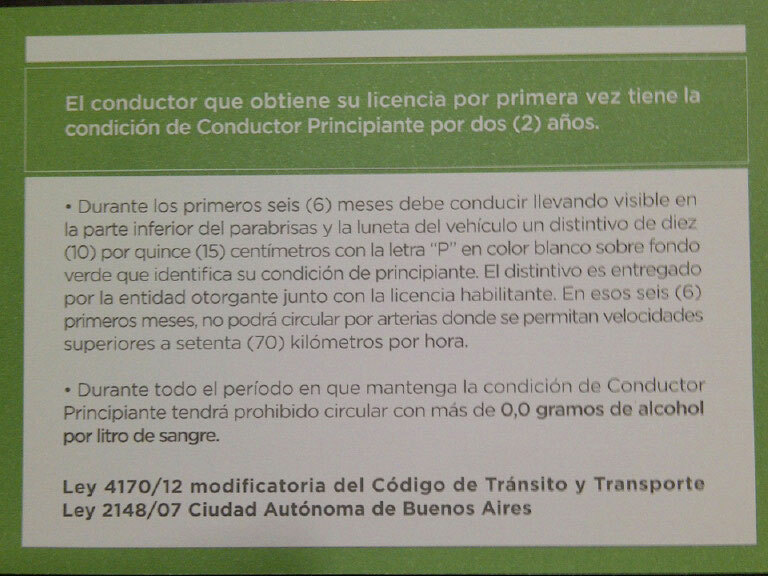 That last point (and getting hit by a motorcycle recently), finally pushed me into dealing with Argentine bureaucracy and going to get my license. The process is relatively straight-forward – if a bit time consuming. I’m going to detail the steps involved as some of the info I found on other expat sites has changed. Note that you must have a DNI to get your driver’s license. Also, having a valid foreign issued driver’s license with the certificado de legalizacion means you’ll get out of taking the road test though you will still have to take the written test. Bring photo copies of both of these with you when you go (although they do have a place that does onsite photo copies too). The first step is to make an appointment. You can do this online at the Buenos Aires city website or by phone at 147. On the day of your appointment, you’re going to have to head out to Dirección General de Licencias, Av. Roca 5252. This is way outside of the city, so plan on over an hour by bus or half an hour by car. I hope they do not keep everything on paper! If you have a valid U.S. issued driver’s license (and the certificado de legalizacion) and plan to skip the driving test, you next have to walk out the back door and go to the second building on your left – Archivos. In the archive office, you present your U.S. license so that they can enter it into the system which is used up front. At this station, you wait for your name to be called and are handed a form with the results of all your previous tests. If you passed everything, you then need to take this form to pay the fee and then take the written exam. The cashier’s are just across the way from where you pick up the paperwork. You simply give them your paperwork and $180 pesos and they validate that on the form. You then head out the back of the main building again and go to the exam building which is straight ahead of you. As I said, with a valid driver’s license, you do not have to take the driving test, but you are required to take the written exam. There are some other sites that mention you have to listen to a talk, but that no longer seems to be a requirement if you have a license. The exam is 30 multiple-choice questions on a computer, and you must score a 75% or higher to pass. All the exam questions are available on their website. The only document that really matters there is “Preguntas para los Exámenes.” If you read through those and understand them, you’ll sail through the exam. My worry was that with my still limited Spanish, I would have a hard time with the exam. Luckily, they also have the exam in English! Well ok, they have the exam in English as an option, but of course, it was not working. I sat down, the first question came up in English, but there were no answers to choose from. I had to call the moderator over who put it back into Spanish for me. He then told me, “I speak English, so I can help you if you need it.” (I’ve also heard from other people who asked for help in English and had someone help them with it.) Anyhow, as I started the exam, all the questions were pretty easy based on my reading the document I mentioned above. I sailed through it and scored a 93%. I’m now able to drive legally in Argentina after being a resident for the past two years! As I said, the process is fairly straight forward though time consuming and a pain to get to. Let me know if you have any other questions.